Total distance: 1700 km (1060 mi). There are various principles for organizing the streets of a city. Berlin is based on stars and rings, and American cities are usually rectangular grids. Paris is based on diverging bundles. This means that the wrong coice of a lane can put you in the wrong part of town with little chance to make a turn because everything is one-way. Traffic in Paris is murderous too. It is said that the only way for a pedestrian to cross a street in Paris is to be completely oblivious of the fact that there may be cars, because while they won't give you a break they will do their best not to kill you. Or so I hope. Paris could be more beautiful than it already is if automobile traffic didn't have absolute priority. All those gorgeous buildings and palaces, separated by cracked sidewalks and endless expanses of asphalt, with few trees outside the carefully fenced-off parks. But if you ignore this, Paris is beautiful. I have often been there and have enjoyed it every time. I especially like the Jardin du Luxembourg and the Montmartre, despite the crowds of tourists, and those small side streets outside the busy center with their small cafés and shops. Plus all the usual tourist watering holes, like the Louvre, the Centre Pompidou, Notre Dame, Sacré Coeur, the Arc de Triomphe, the Eiffel Tower, and various others. Forget the Champs Elysées. I'll spare you the usual pictures. An excellent place to stay in Paris is the d'Artagnan youth hostel. After meeting at the Gare du Nord, the northern train station, my friend and I didn't stay long in Paris this time and rode south through the aforementioned asphalt jungle. Paris can very quickly lose its charm when you leave the center and enter the ``Banlieue'', the suburbs, but eventually we left Paris at the Porte d'Orléans, and rode south towards Orléans. 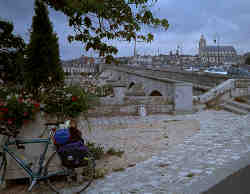 After the difficulties crossing Paris we didn't quite make it all the way to Orléans, and stayed in a hotel. This turned out to be a very memorable decision. I am not talking about a motel. This was the house of a family operating some fruit orchards, very old and unremarkable from the outside. We were welcomed by an old lady who led us to a simple but comfortable room upstairs. They had three of these, but we were the only guests. Dinner was served in their large poorly-lit living room. The old lady asked what we would like to eat, and then proceeded to her kitchen to prepare the food. It was delicious. I wish I had written down the name of the village. This set the theme for the rest of the trip. There was nothing of the businesslike efficiency that I know from my tours in the United States. This was the old French countryside and very much determined to stay that way. (Ok, St. Nazaire was an exception, more about that later.) By the way, we were using yellow Michelin maps, 1:200000, for planning the tour. The maps are best bought in France. Chambord is one of France's most showy castles. It's huge, with countless towers and halls and courtyards, and can be toured. It's the kind of place where the builders worried about the most convenient way to ride a horse into the banquet halls. The picture at the top of this page shows the main entrance. Unfortunately most of the furniture was destroyed or sold during the French revolution, but it's still a spectacular place. 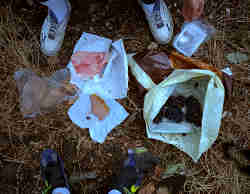 It also has a large park that we used to have lunch, consisting of pâté, baguette, and grapes. The picture shows the general concept. I won't tell where we got the grapes. The roads along the Loire are scenic, often with a view of the Loire, and often pass through small villages with stone bridges crossing the river. 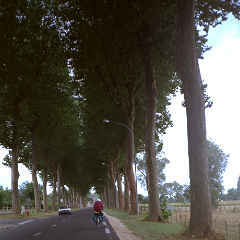 Often they are tree-lined roads through farm land. There are many tourists, and traffic is moderate in some sections, turning heavy on the four-lane roads near Nantes (which we called Nantes Inferno because of the difficulty riding a bicycle there, in reference to Mr. Alighieri). French drivers will leave plenty of space when passing if there is space. If not, they'll pass anyway. 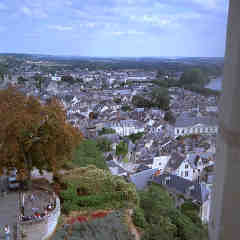 The pictures show a typical road along the Loire, the youth hostel west of Orléans, the main square of a medieval village, and a view from a reconstructed castle whose name I forgot. The coastline between St. Nazaire and Quimper is one of the main tourist areas of France. Traffic is more heavy and picturesque country villages are replaced with huge ugly concrete tourist bunkers, all with a view of the ocean and the traffic jam in front of their doors. Screaming children, countless beach wear shops, all the achievements of modern mass tourism. It's often possible to escape on small side roads though. After Quimper, we took a quick and very un-scenic detour around the small peninsula there, admired their housing projects and featureless coastline, and turned towards Brest. We entered Brest by ferryboat that took us across the bay to the Brest harbor. Brest itself is not particularly interesting, it was largely destroyed during World War II because there was a German U-boat harbor there, but it marked the beginning of the northern Bretagne, and got us out of the tourist areas. After Brest, we rode more or less along the English Channel coast with its rocky cliffs. The Bretagne is slightly hilly, we were constantly climbing or rolling down small hills, but they were small enough to not slow us down significantly. All over the Bretagne one can find menhirs, large conic stones erected upright all over the northwestern end of the Bretagne, often topping 5 meters or more. They have entire menhir fields there with hundreds of menhirs. I am told they date back to neolithic times, about 5000 BC, and the later druids were just squatting. Still, Asterix merchandising is the big thing there. 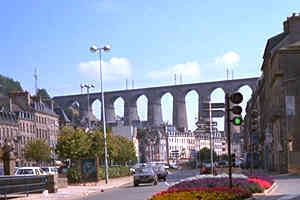 The picture shows a small town near Morlaix, with a huge old masonry bridge crossing the center of the town. It was memorable because we had excellent crèpes there, filled with mushrooms and ham and cheese, baked in the oven. Our next stop was St. Brieuc, not because it is particularly interesting but because my favorite aunt lives in a small village nearby. 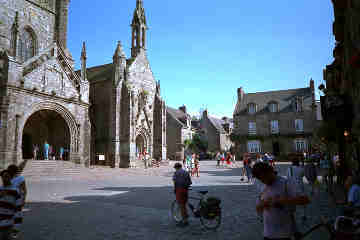 We spent several days there and used it as our base for excursions to le Mont-St. Michel and St. Malo. 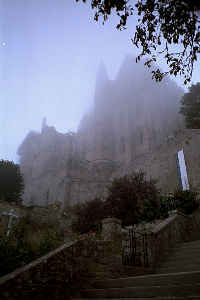 Mont-St. Michel is not in the Bretagne, it's just on the other side of the border in the Normandie. 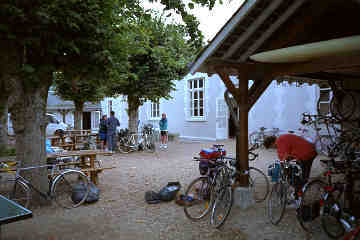 They have a nice youth hostel in St. Michel, parts of which were still under construction in 1993. The main attraction is a cloister on an island in the bay. The island has been totally converted to a cloister by the monks, complete with a large cathedral and many outbuildings, and high walls. Seen from the outside, the island is shaped like a cone, with the cathedral built on the highest point of a natural hill. When we got there, it was foggy, which added to the sinister medieval Name-of-the-Rose atmosphere (if you haven't seen this movie, by all means do so). We were also very early, before the tourists flooded the island. They have a parking lot for tourist busses right in front of the outer walls, and converted a (thankfully short) stretch of road inside to a tourist trap where one can buy postcards or trashy paintings of Mont-St. Michel with the sun rising in the background. It doesn't really look like on the paintings because the sea level is falling there and the island looks more like a beached whale at times. The rest of the buildings is largely in their original state though. It's definitely worth a visit. See our Holland/Normandie tour report on this server, which arrived at le Mont St. Michel from the other direction. 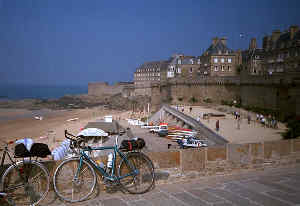 The last excursion went from St. Brieuc to St. Malo, which is a pleasant district capital that adjusted to the demands on a modern city by closing off most of the old downtown, still mostly ringed by its walls and cannons pointing out to the sea. Not that there are no cars there, we are in France after all, but it's easy to get around as a pedestrian. 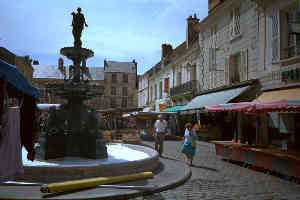 The modern part of St. Malo is outside of this downtown area. We didn't ride back from St. Brieuc to Paris, we took the high-speed TGV train. I shipped the bicycle directly back to Berlin, which normally takes a few days (always more than claimed). The train isn't doing high speed all the time and was rather cramped, but it is an excellent way of travelling, and certainly beats air transport, which is extremely expensive in Europe anyway.